This analysis drew its data and conclusions from an Excel based simulator. Details of this simulator are described in: APPENDIX – METOHDOLOGY and APPENDIX – EXCHANGE SIMULATOR . The downloadable simulator, permits users to change a variety of assumptions and to view the results in graph and table form. This Excel file contains no macros or VBA that may pay pose a security risk to users. Before the Affordable Care Act (ACA), people with chronic and costly illnesses, if not buried in debt, were sorely stressed from medical liabilities they incurred. ACA shifted excess costs to insurers when it prohibited any health exclusions and annual and lifetime limits. Government reinsurance could further shift these excess costs away from insurers. This last effect would draw Billions of dollars from the Exchanges and allow premiums and costs more in line with pre ACA days. Lower costs happen despite retaining all the essential health benefits added by ACA. Of note is that while the government reinsurance costs would rise significantly, subsidies for lower-income users drop by billions. When one includes the lower premiums and deductibles for users, combined savings can significantly exceed any increase in government costs. . Users benefit while government pays out more. The difference is in fact identical to a direct tax cut for the middle class. Few issues generate as much controversy as the Affordable Care Act (ACA). As U.S. health care constitutes nearly 20% of GDP, $3 plus Trillion and over $10,000 for every person, the issues are both economic and political. One cannot easily solve the political issues. However, one can add perspective. First, the bulk of ACA changes have broad acceptance and help make improvements to many different aspects of health care. Most controversy centers on Exchanges and Medicaid Expansion. Alternatives to Medicaid Expansion have not been very helpful, other than to free up Billions of dollars for other uses. More valid ideas exist for amending Exchanges. This analysis focuses on just one ACA amendment. ACA removed a financial burden from people by prohibiting medical exclusions and caps on insurer coverage. However, those costs did not just disappear. Now insurers are left “holding the bag” for these costs. Government has helped with subsidies. Nevertheless, the long-term answer would be to shift further all the highest user costs from insurers to the government. Note the difference between “highest user costs” and “highest cost users”, as in high-risk pools. Reinsurance keeps everyone in the main pool and offers the most efficient method to achieve affordability. Not only does reinsurance relieve insurers of a costly burden, it also draws billions of “duplicate” dollars from the entire health care system. Obviously, any major change will affect stakeholders in different ways. The following section highlights a few. This would present a mixed bag for insurers. Reinsurance will drastically lower their costs that are coming from a very small minority. Medical loss ratio (MLR) minimums will force down premiums. Exchange Insurers employ a cost-plus scheme that directly affects profit opportunity. Falling costs lower insurers’ profit opportunity; higher costs raise them. Favorable for insurers is retaining a customer base on which to market additional services. Solve ACA Exchanges’ cost issue and insurers can expect greater user enrollment as well. Reinsurance proposed here assumes Federal government funding. Medicaid costs do involve state government, but their role regarding Exchanges is little changed. Reinsurance should be a major boon to small employers. Both before ACA and with ACA, small employer health insurance has always been higher than for large employers, not just from economies of scale, but also from many large employers being self-insured. Self-insurance eliminates the “middle man”, namely, the insurers’ markup that adds major costs for smaller employers. Small employers are more likely than large to grow, which could prove to be a jobs boost. Lower cost is an obvious benefit for individuals. Another major benefit for individuals is that reinsurance would bring back insurers leading to far more competition on Exchanges. Network “shrinking” should decline along with some of the frustration with the current Exchange market. Those not eligible for subsidy, though not by any means rich, will gain from lower premiums, deductibles and co-pays. Most people would accept paying a fair share for insurance. However, the extreme skewing of health costs and ACA restraints tilt this unfairly. This has led many to go without insurance, or to pay the penalty as less onerous options. A major reduction in costs would make coverage palatable. There are always a few to argue that about the need for some female benefits. Perhaps they slept through biology class. ACA assures that males and females are treated equally. With reinsurance drawing billions from Exchange health costs, elderly are likely to benefit as much proportionately as younger, healthier people. Older workers are more likely than younger to be laid off in a downturn, and reform would provide an affordable option until Medicare is available. By removing dollars from health insurance, Exchange costs will be more comparable to corporate and government plans. This may lead some who have an option to switch to join an Exchange and be insurance independent of their employer. It may also be a precursor to transition health insurance from employer based to individual based, or even single payor. The following analysis draws its data from an interactive simulator explained further in the Appendixes. Six cases compare differences from before ACA to two reinsurance cases that bring user costs down to pre ACA days but with far better coverage. For each case, there are two side-by-side graphs below which are the assumptions for those graphs. 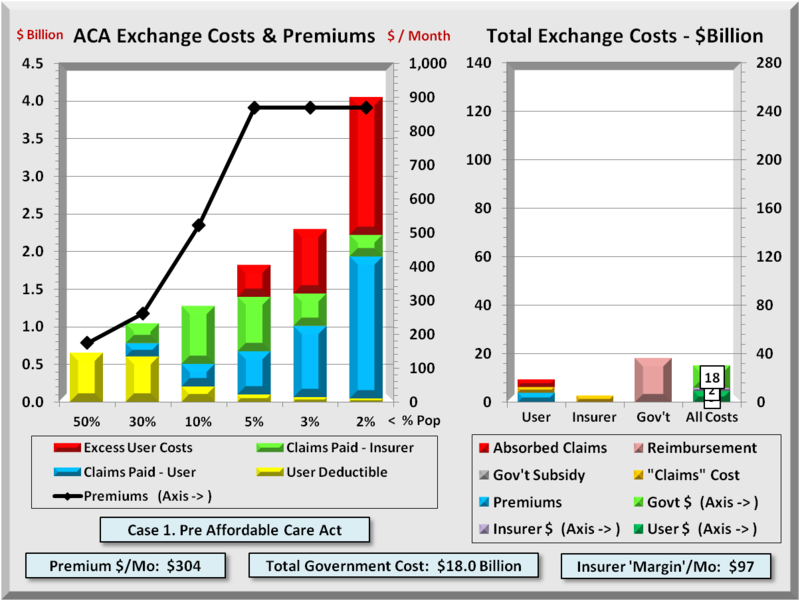 The following graph shows Exchange member costs under “Pre-ACA”. ACA will change two key (yellow) assumptions that bear noting. One is the “User Annual Limit” that caps what insurers will pay, and second is the Medical Loss Ratio (MLR) that reflects a typical MLR for individuals and small groups prior to ACA. Prior to ACA, insurers paid only to the annual limit, forcing members to absorb any excess costs. Insurers also could raise premiums to increase their margins, as there were no MLR limits on insurers’ profits. The first bar in the left graph (50% of members) had costs less than their deductible (no blue bar) where insurers paid no claims. The next two groups (40% combined) did co-share with insurers (green bars), but the three groups at right (top 10%) were also forced to absorb their excess health costs (red bars). As regards premiums (line graph), they were low for healthier members but were often 5 times (or more) higher for older, less healthy members. Premiums averaged nearly $440/ month, not exactly affordable to many. 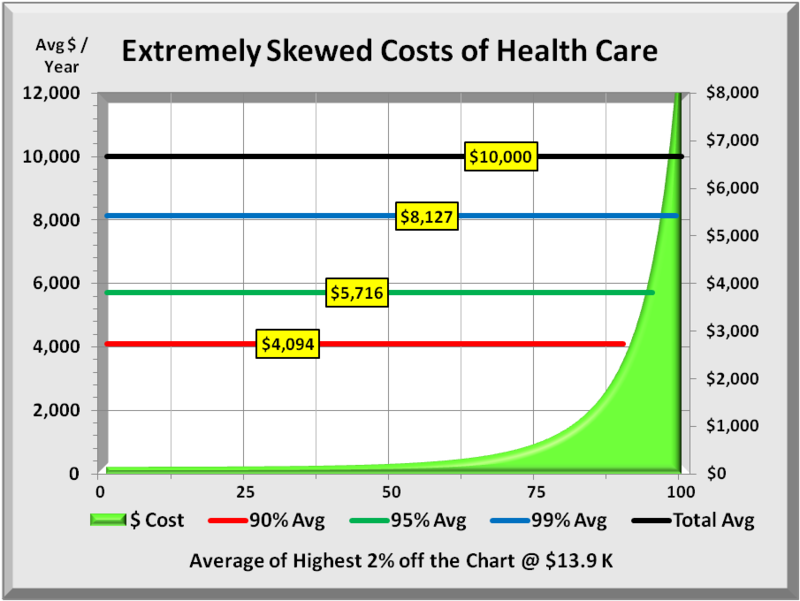 The right graph shows an often-overlooked cost item. The copper (3rd) bar shows government reimbursements ($18B) to hospitals and providers. It covers medical service costs for uninsured people. Analyses have found that the uninsured incur about half the health costs of insured. Government has always been deeply involved in health cost support prior to ACA, just in a less visible way. The low amounts in first two bars are due to only 10% Exchange members being insured. Finally, bottom right shows a significant Insurer “margin” of $97 per month that insurers received. This is the difference between premium received and costs paid out. Self-insured companies get by with far lower margins, while individuals and small business withstand the brunt of insurers’ profits. Like Case 1, the following graph shows Exchange member costs under “ACA mid 2017” conditions and assumptions. The key change, however, was a shift of some $35 B excess cost (red bars) from ALL 10 million now insured members to insurers. This led to large increases in insurers’ costs that insurers passed back to users as premiums and deductibles. ACA had hoped that with mandatory enrollment, healther members with lower costs would balance those with higher costs. A 3:1 max premium spread also forced up premiums for younger members. With only mild penalties, enrollment ran below expectations, requiring insurers to increase both premiums ($698) and deductibles (to $6,000). Not visible is how many did not enroll due to the effect of these actions. In the right graph, Gov’t reimbursements for the uninsured are replaced by ACA subsidies for the poorer insured. These costs exceeded reimbursement savings for a small increase. Meanwhile, the sum of all costs rises to over $200 Billion. 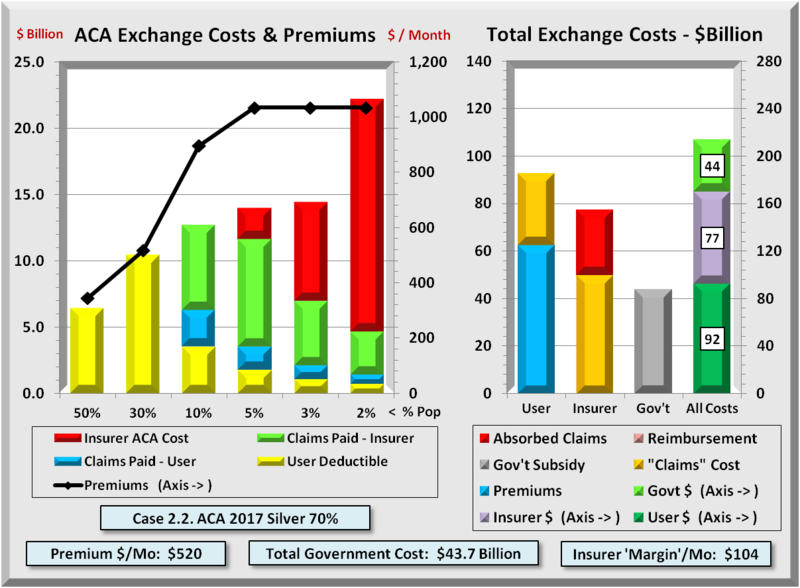 The following graph shows costs for ACA Silver plans. One would expect user costs to decrease when insurers pay more on claims. However, higher insurer payments lead to higher margins, that rise above $100/month. Those claims payments and added margins actually exceed initial user claims payments. The net effect is that that users come out worse on average. All this assumes an exact 80% MLR effect on margins. Meanwhile, total costs (last bar at right) remain high at over $200 Billion. The following graph shows costs for ACA Gold plans. This is a repeat of Silver plans addressed just above. The more insurers pay, the more margins rise. Together, that raises user costs. Moreover, government subsidies to poorer insured are dependent only on their income. As health care costs rise, this forces government to increase subsidies to keep these insured users whole. If all 10 million users had gold plans, total costs under current ACA conditions would rise above $220 Billion. With greater insurer payments inflating government subsidies and user costs even more, then one logical way to correct this is to lower what insurers pay. Just as ACA shifted user costs to insurers by increasing user protections, one can increase insurer protections by government reinsuring their highest costs. Reinsurance is not an insurer bailout but an efficient way to reduce their involvement in claims payments. MLR constraints will limit margins and any notion of bailout. 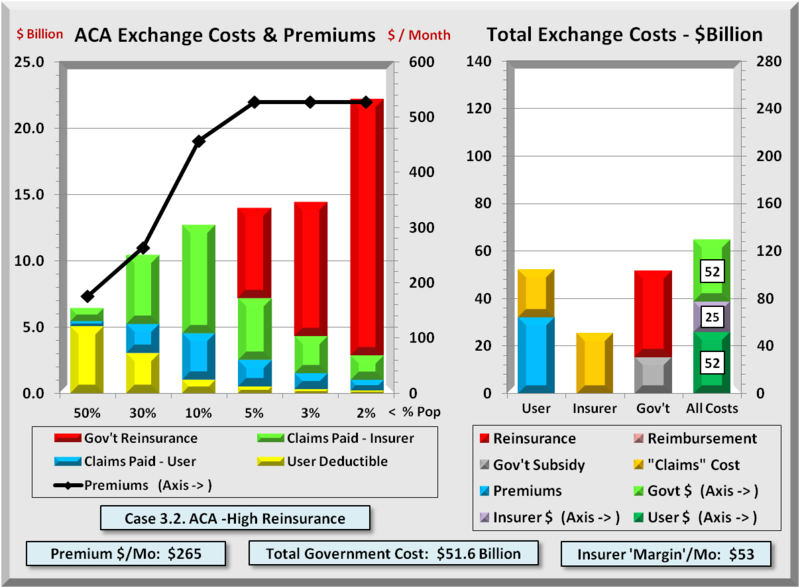 Like all Cases, the graph below shows Exchange member costs under “ACA with Government Reinsurance”. 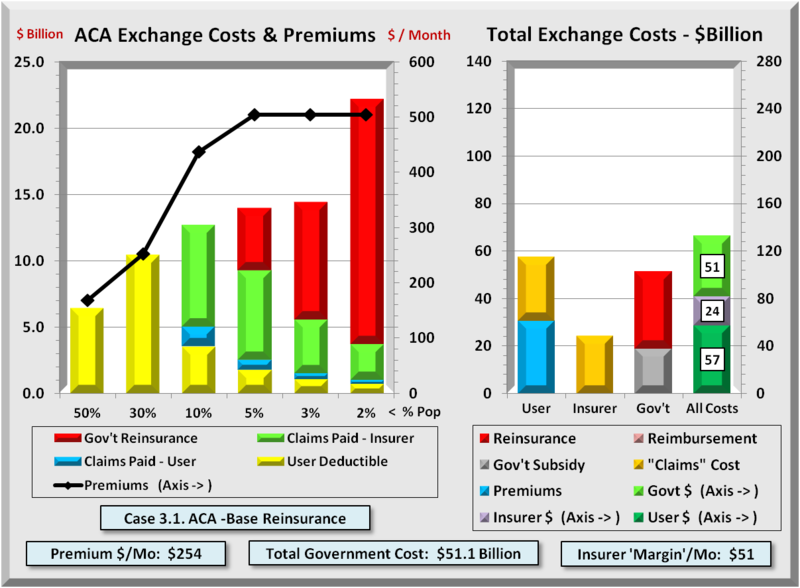 This shifts some $34 B of “excess” costs (red bars), but this time from insurers to government. With this shift in costs, the risk to insurers declines to less than what existed prior to ACA. The premium effects are dramatic. The highest Premiums (for older folks) drop almost in half compared to Pre ACA levels, while the lowest decline as well. 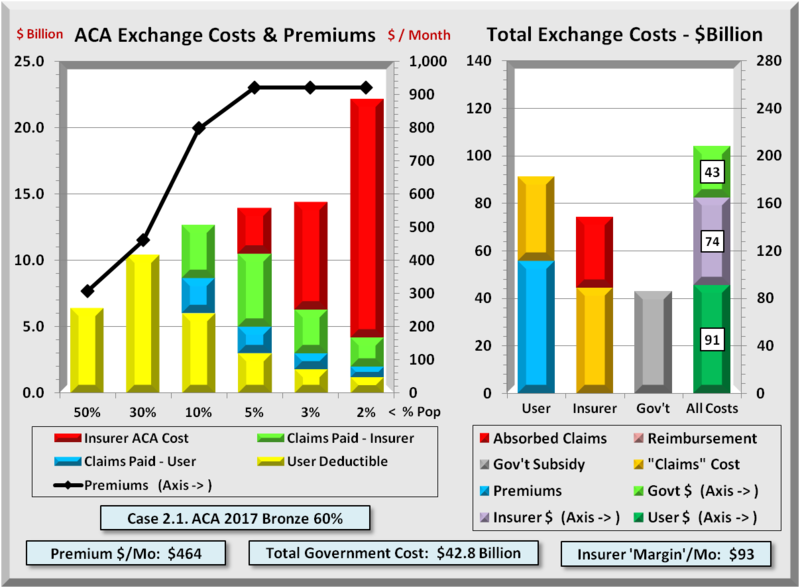 One can see the dramatic reduction of Total Exchange Costs by comparing the right graph above with any of the previous ACA cases. The axes on the right graph are fixed at $140 billion for Users, Insurers, and Government, and $280 Billion for all combined. In each of the ACA cases, the combined costs of all three parties were over $200 Billion. Reinsurance greatly lowers user and insurer costs, though increasing costs to government. The total combined costs drop to $130 Billion, some $70 Billion below curent levels. Every dollar for which an insurer is liable more than doubles the claims cost. This is because insurers add an overhead margin to claims paid. They then recoup via premiums and deductibles from users. If government is liable, there is that much less for insurers to pay. And if they don’t pay, they they also have to cut their margin to remain MLR compliant. The government is currently paying some $42-45 Billion in subsidies to insurers. As premiums decline with reinsurance, so do subsidies. The net result is a modest $8 Billion increase to about $52 Billion in government costs. Contrast that with at least a $35 Billion reduction in user costs. That has the same effect as a $27 Billion ($35B-$8B) tax cut, and nearly all of that is for the middle class. What should surprise nobody is that when risk shifts to government, there is no middle man (private insurer) to add overhead for marketing and profit. This is one reason why Medicare and Medicaid cost materially less per person than does private insurance. Government doesn’t charge extra for “risk.” Medicare also fixes prices, relying on doctors in private practice for input, but that is another story. Less well known is that many of those same private insurers that ACA forced to reduce margins to “only” 15% to 20% perform nearly all the same administrative tasks for Medicare and Medicaid for less than 5%. There is one more appeal to the reinsurance model. 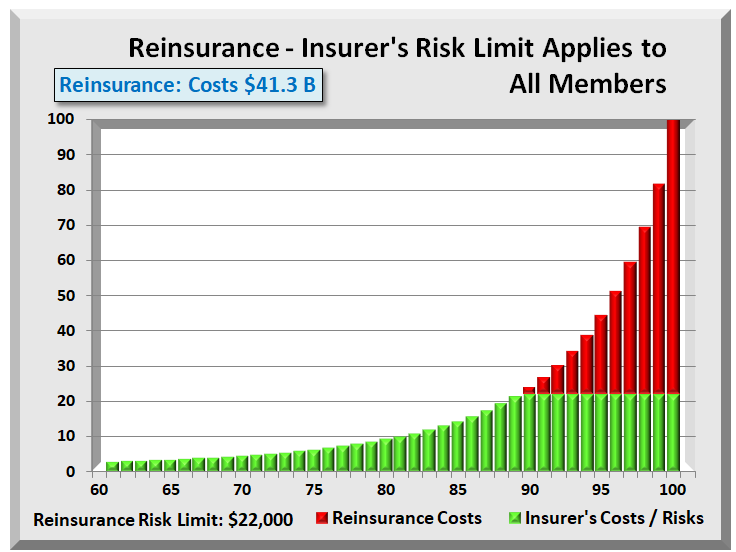 Lowering the threshold from $15K to $5K in graph below, transfers the bulk of insurer risk and related cost. Insurers are at risk only for lesser amounts. As claims bypass the middleman and his markup, Exchange premiums decline to near Medicare levels. All the while, insurers can remain in (or return to) Exchanges with an opportunity to sell additional benefits and find ways to lower costs even more. Reinsurance retains the creativity and inventiveness of private enterprise to reign in costs. Without changing essential business processes in use today, one can greatly reduce Exchange costs by implementing ACA reinsurance. Shifting most risk from insurers would be like insuers being third party administers for self-insured companies. One major insurer benefit is they retain a built-in customer base where they can market features beyond ACA’s essential benefits. Like other countries with single payor systems, the U.S. can still have a vital albeit smaller private insurance market able to offer health features beyond basic government benefits. They are also free to adapt to special conditions of their markets. Best of all, Congress could make the threshold adjustable to rebalance, as needed, consumer affordability and private insurer sustainability. That is a fiscally conservative idea with a major benefit both to the middle class and to the health of all Americans. To find a solution, one needs to understand the problem. Health care insurance is not like most insurance policies about which many are familiar. With most insurance, there is a fairly symmetrical form to their costs: some low, some high, most near the middle. Acceptance occurs when those with lower costs feel the “premium” is worth the protection. However, health costs are extremely skewed, with a huge majority of low cost members expected to cover extremely high costs of a tiny minority. Adding a mandate to buy health insurance simply adds to the discontent. The first step was to develop an exponential math equation that would roughly mirror the actual health cost distribution where the top 1 % consumes 20% of all costs, the top 5 % – 50%, and the top 10% – 60% of all costs. Then build a table with 100 cells of equal population sorted by cost. The graph below does this and highlights how skewed health costs are. With an average cost for the U.S. of about $10,000/year, it was necessary to limit the right axis values in order to view any of the lower costs for 90% of the population. ACA further limits insurers to a maximum ratio between highest and lowest premiums of 3:1. Insurers responded by increasing deductibles in order to maintain reasonable premiums. The result was deductibles rising to the $4,000 to $6,000 range. Even with high deductibles, premiums are still uncomfortably high. Deductibles are often far above 80% of the members. These lower cost members never collect any of the insurer’s co- payments. Even at $2,000, few members exhausted their deductible (red line) in the next graph. Nearly all agree of the need to shift costs from insurers to government. This analysis considers two ways. In an effort to bring down costs, some favor funding (state run) high-risk pools that remove high cost members from the main pool. Applying this to the highest 4% cost members yields the graph above. With High-risk Pools, Health Insurers have total protection only from those in the pool. They still retain the risk that one or more of those in the main pool will incur exceedingly high costs. With over 95% of members still at risk for substantial claims, insurers will cover this risk by raising premiums, deductibles, or both. As pools often have stricter conditions, users face obstacles for even small claims. Another way to shift risks and costs to government is with reinsurance, a form of which ACA included until Congress blocked its funding as a “bailout of insurers.” A permanent form of reinsurance is needed like shown in the next graph. Several kinds of reinsurance are available. “Treaty” transfers risk when overall costs exceed a threshold. “Facultative” is the recommended form for health reinsurance. It covers only an individual’s excess costs. Insurers already have systems in place, as the logic is identical to annual limits of yesterday. Only now, costs are forwarded to government, not returned to the user. An important conclusion is that reinsurance protects health Insurers from high costs over the entire pool. They can more readily define risk and do not need to add more risk for potentially large claims from any member. Another advantage is for those with chronic illnesses. If they incur common injuries or sicknesses having nothing to do with their chronic illness, they still have pool coverage common to all. Unlike high-risk pools, reinsurance offers ALL members equal treatment for any illness or injury. 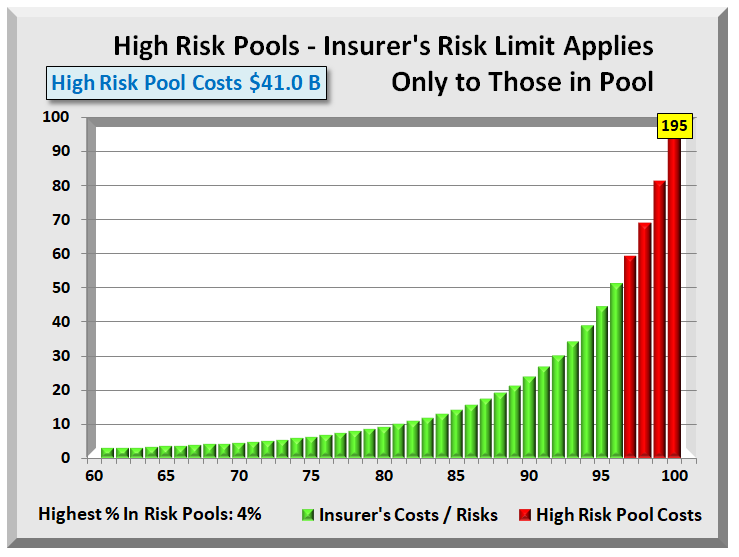 Finally, one can compare the costs of high-risk pools versus reinsurance. In the graphs above, assigning the top 4% to high-risk pools is equivalent in cost (but with greater risk) to setting a $22,000 average reinsurance threshold. At this point, there are 100 cells (members) each representing 1% of the population. Now consolidate the100 cells into six groups or “buckets”, where the total cost of each is higher and the population is smaller than the preceding group. This led to population groups (in ascending cost order) of 50, 30, 10, 5, 3, 2 = 100. The result is having the cost for each group and total. The actual total cost is not important. What is important is knowing the percent of total costs are in each group. Applying these percents to any cost total determines the costs for each group. Total cost is simply a product of Exchange members and their average costs. With costs by group defined, the next step was to build the precise and detailed logic or rules of how insurers process all health claims. All insurers must abide by the same rules in the table below, but not necessarily using the same values. All the graphs above drew their data from an interactive simulator that covers 3 Cases or phases of ACA health care. The table below shows assumptions and results for six cases. 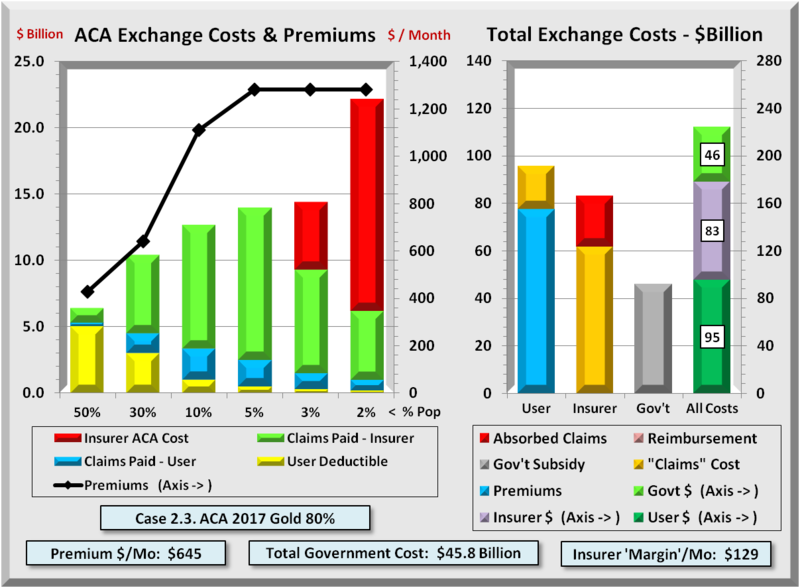 One is before ACA, three are cases representing Bronze, Silver, and Gold ACA, and finally two showing ACA with Reinsurance. Identical logic applies to all cases. Focus on the top three rows and their sum, “Total Cost All Sources” row, in yellow. While Government costs go up, User and insurance go down. Today those combined total costs are running over $200 Billion. 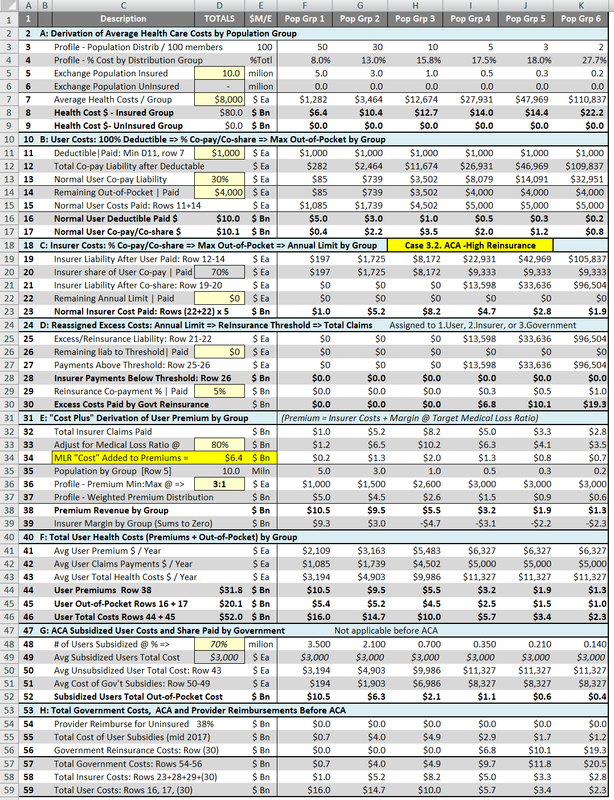 Note in the last two columns with reinsurance, total costs drop significantly to about $130 Billion. The $8-10 Billion increase in government is more than offset by member decreases of $40 Billion, and by insurer decreases of $50 billion. Reinsurance literally “drains” billions of dollars from Exchanges. 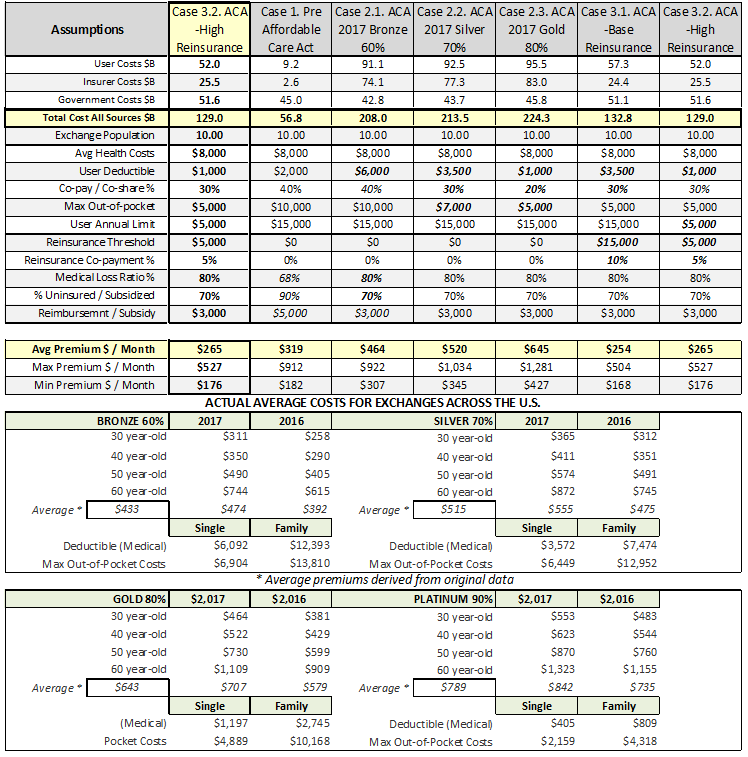 The table below shows the detailed calculations for the final case, “ACA with High Reinsurance”. The assumptions are in yellow in column D. The eight blue shaded rows describe the computations immediately below each. Section D, “Reassigned Excess Costs” shows who bears excess costs (user, insurer, or this in case, government) and how much are those costs. 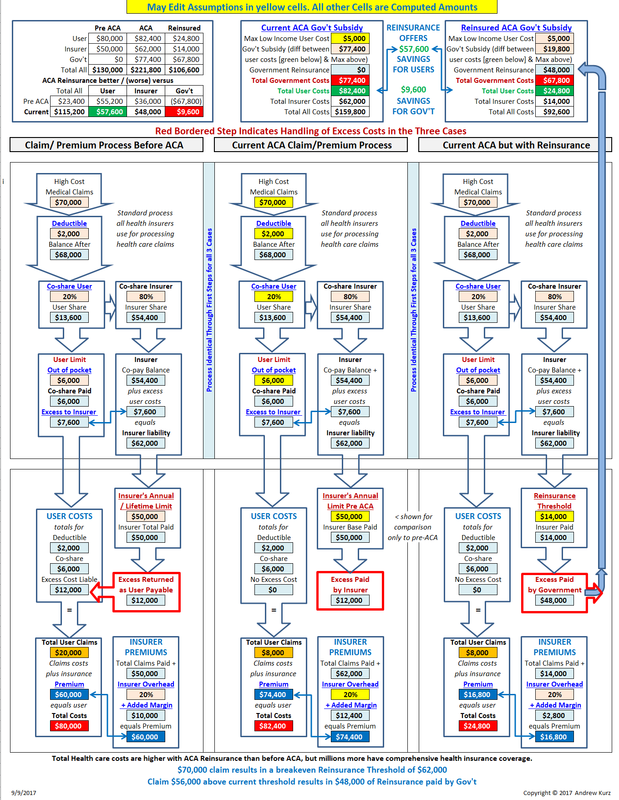 Below is a process flow diagram of major components that impact ACA reinsurance. It contains three columns representing health claims process  before ACA,  the current ACA process, and  ACA with government Reinsurance. Initially, the process is identical for all three, but it diverges when handling “excess” costs as shown by the three red bordered boxes. Shifting those excess costs to government as reinsurance dramatically drives down total costs for both insurers and users. The two boxes at top right add the effect of lower health care costs on government subsidies to arrive at the combined net savings from users and government. This process diagram is a picture of an Excel spreadsheet in which one can change the assumptions in yellow highlighted cells. Can decrease health insurance costs by 40% or more for small businesses, key generators of jobs in the U.S.